Imagine a day at a theme park where you not only enjoy the attractions but you also enjoy the wait in line too! 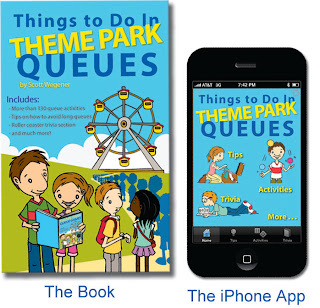 Just like kids travel game books are great for long car trips, this book and iPhone app, specifically written for the unique theme park queuing situation, will help to stop the boredoms of standing in line. Over 120 activity ideas, hints, tips, and activities designed and themed specifically for theme park queues.